There is Beauty in Change. 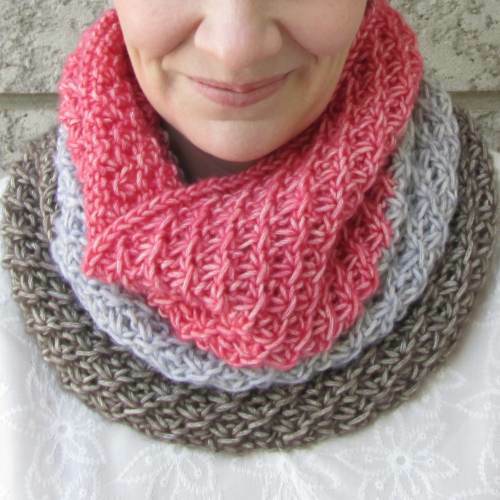 This cowl was designed to celebrate the beauty of the change in seasons. The colours—earth to frost to flowers—reflect the seasonal transition. The yarn—Merino Wool & Cotton—keeps you comfortable no matter the weather. And, it’s tall enough to wear as a snood if the wind picks up. Pretty & Practical! 17” (43 cm) tall x 24” (61 cm) around. Katia Concept Cotton Merino (70% Cotton, 30% Extrafine Merino Wool; 115 yards/105 meters per 50 gram ball): 1 ball #105 Brown + 1 ball #106 Light Grey + 1 ball #110 Coral. One 24” (60 cm) circular needle size US 11 (8 mm). 16 stitches & 20 rounds = 4” (10 cm) in Pattern.